​The rail has enabled our members who are wheelchair bound or who have difficulty walking to access the Bimah when without the rail they would have struggled. It has made our Synagogue feel much more inclusive. Our newly developed synagogue in Brighton and Hove opened its doors to the community on Shabbat Chanukkah 12th December 2015 – 30th Kislev 5776 – with a rededication led by Rabbi Elli Tikvah Sarah, who welcomed back the congregation to their new spiritual home. Vacated for redevelopment for over three years, the synagogue had been our home since 1937 - but was in desperate need of modernization. We now have a beautiful state of the art building including a large sanctuary, office, library, education rooms, pastoral care room, a social area and kitchen accommodated over two floors. We simply could not have completed the project without a grant from the NLPS Trust towards furnishings, including all the seating, tables, bookshelves and cupboards for every room. We cannot thank the Trust enough for deciding to support us. Since the small Crouch End Chavurah could not afford to purchase a Torah scroll, it received one on long-term loan from the Danish community, from where its Rabbi, Sandra Kviat, originates. The scroll, however, was bare of ‘rimonim’ – the usual dressings that decorate and protect it. Through the grant we provided, the community was able to add these. ​a Torah scribe to trace the scroll’s provenance and history. Avielah Barclay – the first female ‘soferet’ for 250 years – visited the community and revealed that the scroll was probably written more than 100 years ago by a scribe from the Polish tradition. 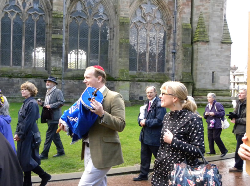 ​Sukkat Shalom, the Edinburgh Liberal Jewish Community, had been ‘getting by’, placing its Torah scroll on a table and covering it with a tallit – but it wanted to house the scroll properly. Our grant contributed to a new portable ark, designed by community members Lauren Fox (pictured right) and Katy Bromberg (left), constructed from local wood by Scottish craftsmen and replete with doors made from laser-cut aluminium. The inscription and the ark curtain reflect the theme of the tree of life. Herefordshire Jewish Community were granted funding for the repair of a Sefer Torah, a mantle and the construction of a simple wooden ark in April 2013, together with the production of a commemorative programme for the dedication to generate publicity and recognise the partnership between the museum authorities, the city of Hereford and the community. This played an important step in raising the profile of the community in one of the previously most important centres of Judaism in medieval England. The Liberal Jewish Synagogue’s Drop-in for Asylum Seeker Families has been running since June 2014. ​The grant we received from the NLPS Trust for Progressive Judaism has made a huge difference to the Drop-in’s financial capacity and has enabled us to continue providing help and support to the increasing number of families who now attend the Drop-in. Thanks to the support of the NLPS Trust, the Drop-in has now registered over 400 families seeking asylum. In 2017 alone, we provided over 2,500 hot meals as well as school uniforms for all the children who come to the Drop-in. We feel very proud and grateful to be recognised by The NLPS Trust. Our sanctuary seats 200, but we only had 120 wobbly, heavy old red chairs. Over the past couple of years we have undergone several large refurbishment projects and new chairs were definitely not on anyone's agenda. However, with the generous help of the NLPS Trust, we are all thrilled to have acquired 200 fabulous new chairs. They are much safer and more comfortable than the old ones and look smart and elegant in our sanctuary. We are extremely grateful to the NLPS Trust for their help and support and for making this wish come true. The library project allowed us to transform our old and rather out-dated library into a modern and welcoming multi-function space which is now used not just as a library but also as a meeting room, a reception room and a learning centre for Bar and Bat Mitzvah classes and the Conversion Class. NLS extends its thanks to the NLPS Trust for its valuable support. It’s frustrating to attend a service or meeting and not be able to hear what’s being said. This was a problem at the Oxford Jewish Congregation, and we were therefore delighted to be able to award them a grant to purchase a microphone. ​“It used to be so difficult to follow the service,” said Heather Booth, (pictured left), “but now it’s clear as a bell." The late Malcolm Cottle had been organist at North London Progressive Synagogue for about 40 years and transferred to Southgate Progressive Synagogue when NLPS closed. After some years playing organ at Southgate, he recommended that the instrument be replaced. ​Thanks to the support of the NLPS trust, the Abraham’s Tent Project, which is converting part of the South London Liberal Synagogue (SLLS) building into a flat for a refugee family, is nearly complete. SLLS needed to raise nearly £50,000 to convert a derelict caretaker’s flat into a welcoming home for a family of refugees. This was a daunting task for the small South London community, but a grant from the NLPS trust gave the project a major boost, funding the cost of installing a new bathroom in the flat. The grant also supported additional community engagement work, and we were able to host a party for refugees already settled in the local area. The impact has been seen throughout the Synagogue, and many members have become more engaged within the community, helping to make the project a reality. As well as providing a physical home for a family, the project has also put together a group of volunteers who will support the refugee family through community sponsorship. This part of the project, supported by West London Synagogue and Liberal Judaism, is progressing well, and SLLS expects to be welcoming a refugee family in early 2019. Two Liberal communities were the beneficiaries of a single grant from the NLPS Trust for Progressive Judaism. In 2018 the Trust received an application from Stevenage Liberal Synagogue to support the purchase of a new ark, as their existing travelling ark was no longer big enough for the community’s recently acquired scroll. As part of their application, Stevenage said that if they were successful, they would be happy to pass on their old ark to another developing Liberal community. Wessex Liberal Jewish Community usually meets in a hall in Bournemouth but sometimes holds services at other venues and, until now, has not had an ark that could be transported. Stevenage’s application was successful and they now have their new ark. The Trust put them in touch with Wessex who were delighted to take possession of Stevenage’s previous travelling ark. At a service in Ringwood, Rabbi Rene Pfertzel, led the congregation in saying the Shehechyanu when the ark was used by Wessex for the first time.